The fear of public speaking is widespread, and well known. However, there’s no denying that presenting to an audience can help advance your career, build your network, and sharpen your skills. So what’s an aspiring speaker to do? How do you get from “cool idea that I want to share with people” to the stage? There’s got to be a roadmap, right? Thankfully, the fine folks at A Book Apart have it covered. The Authentic Jobs team are big fans of ABA, and we’re ridiculously excited to be able to share an excerpt from “Demystifying Public Speaking” by Lara Hogan, VP of Engineering at Kickstarter. You have two routes to speaking at an event: submitting a proposal or being invited. When you’re starting out, or if you’re switching gears to a new topic, you’ll likely embark on the submissions track. Let’s get excited about filling out some forms! Once the submissions are in, organizers cull them and decide what shape the conference should take, based on industry trends and key takeaways for the audience. Some conference organizers read all of the submissions themselves; others arrange panels to gain more diverse perspectives. As they consider contenders, organizers put themselves in their audience’s shoes: what does that audience want to hear? People don’t go to talks for the content. People go to talks because they think they’ll become more badass. So help them out with that! Make it easy for them to imagine their newfound superpowers, and they’ll match your level of excitement. Don’t take yourself out of the running before the people organizing the event have had a chance to look at your proposal. It’s literally their job to find talk topics that will be relevant and enticing to their audience; you can help their cause—and yours—by choosing conferences whose audience and focus lines up with yours. Creating a solid structure for your content is the best way to guide your audience through your topic—structure helps set expectations for what’s next, strengthen your arguments, and keep folks more engaged. It also gives you a foothold if you lose your train of thought. Solution: the best option and how it works. This was the bulk of my talk, walking through all the ways to improve front-end performance. I’ll be honest: I didn’t think much of this new narrative. I was building a slide deck on techniques to improve page load time. Wouldn’t people—people who were choosing to see my talk—already know why performance was important? Why should I add the landscape, the bigger idea? Enough fluff—don’t people just want the how? Thankfully, I decided to give this narrative structure a shot (uncomfortable feedback is often a gift). Immediately, the presentation was so much better: the story helped draw in the audience, and the logical progression meant they could follow my flow and trust my arguments. Developing this presentation structure also forced me to ask myself: Why am I even speaking to begin with? Nailing down the bigger idea—what I wanted the audience to leave with and think about after they went home—was crucial to making my presentation memorable. This sample narrative structure won’t work for everyone, of course. You have plenty to pick from; a couple include incorporating a backstory or flashback, or following the Hero’s Journey. Your topic may work best with more case studies, graphs, or live demonstrations. Whatever tack you take, think about the talks that have resonated the most with you. What kind of narrative or structure did the presenter follow? Why did it work so well? How did they make their arguments stick? The most important part of your presentation is what happens after; use your presentation to lead your audience to both inspiration and concrete next steps. Once you’re on the speaking circuit, you begin to get invited a lot more to give talks, rather than submitting a proposal through the normal channels. I’ve received invites via Twitter direct messages, out-of-the-blue emails, and connections from trusted friends. Some invites include lots of information about the conference and what they hope I’ll bring to it. Sometimes they include a list of other speakers who’ve confirmed their talks, as a way to convince me that I want to be on that roster. An invite doesn’t automatically mean you’re in; some organizers extend invitations to submit an idea, while others ask you to give a particular kind of talk—which you might not want to do! Feel free to see if they would be interested in a different take. For instance, as I’ve done a lot of web performance talks, organizers often invite me to present the same talk at their event. Some places will ask me to change the length of the talk (I can tell you it’s rough to cram a 90-minute workshop into a 30-minute lecture! ), and others ask for completely new material. As ever, ask questions in turn. Event organizers want and need you to succeed—get their perspective before you submit your pitch. I’ll check if they’d prefer a 101-level topic or more depth; or I’ll see if they have any subject gaps in their lineup they’d like me to cover. Recently, I spoke at a conference that attracts more designers, so I refocused my performance talk to include design considerations on site speed. You want to go for something that feels good to present and is equally as fulfilling for your audience to hear. You won’t get invitations to every conference you want—and it’s okay. Keep submitting, whether it’s through a CFP or your network. The more practice you get with sending proposals, the more you can learn from the process and event organizers about what makes a winning pitch. Follow up with any rejections (we all get them!) to find out what wasn’t quite the right fit, and see if that feedback applies to your next submission. Maybe it’s as simple as “We already had three proposals on the same topic,” or as helpful as “This wasn’t the right technical depth for our audience.” Learning and iterating is the key to each step toward the stage. Ready to take your career to the next level? Check out the opportunities available on Authentic Jobs. BuySellAds has acquired Authentic Jobs. The following is a letter from Todd Garland, CEO and Founder of BuySellAds, to the Authentic Jobs community. 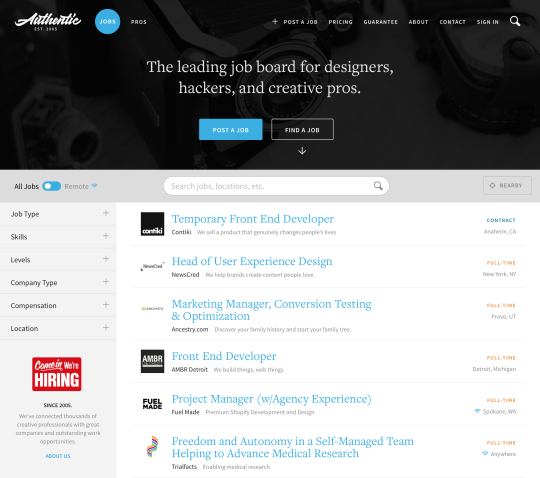 We’re excited to announce that we’ve acquired Authentic Jobs, the leading job board for designers, hackers, and creative pros on the internet. We will be running Authentic Jobs as a standalone business. The Authentic Jobs mission is to give the best talent access to opportunities at the world’s greatest companies. We are passionate about the “web creator” space, and we enjoy working with the many talented individuals and companies who make this space what it is today. We’ve been working with many folks in the design and development space — for the better part of a decade — to create sustainable revenue to help support their tools, blogs, and communities through relevant quality advertising. Now, we want to help those companies continue to grow their businesses by making it easier for them to hire the best people on the internet. This is where Authentic Jobs comes into the equation. For the last few years, as a remote team, we’ve relied heavily on Authentic Jobs to grow our team. We know the power of extending our hiring reach beyond our geographical limitations. We’re looking to bring that experience to Authentic Jobs while we help other great companies and talented creators build a bright future together. Cameron Moll (read his announcement here) and his team have built a great business over the last eleven years with Authentic Jobs. Our plan, similar to what we have done with other acquisitions in the past, is to capture what is unique and extraordinary about the business, but extend the foundation a bit further. The Authentic Jobs mission is to streamline the relationship between those looking to hire and those looking to take the next step in their careers. Our ecosystem, built between Authentic Jobs and Authentic Pros, closes the gap between those looking for new job opportunities and those who provide those opportunities. The system creates better exposure for each side of the equation. Our primary focus at BuySellAds is building advertising technology that helps bring advertisers and publishers closer together. We’re contributing to ad tech’s future. A future that’s built on a transparent and streamlined ecosystem, built on direct relationships, high-quality ad formats, and a fraud-free environment for its participants. Our experiences in those areas are directly applicable to Authentic Jobs. A streamlined recruitment process is one benefit already being realized thanks to Cameron and his fantastic Authentic Jobs team. They have laid the groundwork for some exciting new changes, and we hope to accelerate those changes. There’s already excitement brewing with our partners, and we’re going to help Authentic Jobs continue to grow into its full potential. But, we’re just getting started. Subscribe to the Authentic Jobs newsletter. Keep yourself in the loop and find new opportunities every week. Authentic Jobs and InVision have teamed up to offer two slots in the InVision newsletter for designers. Take advantage of our exclusive partnership and reach 1.3 million subscribers for only $400 (one-time fee, non-refundable). A posting on Authentic Jobs is required, but don’t worry—you can post a job if you don’t have one already! We’ve re-engineered how you use Authentic Jobs for finding talent & work. Here’s a preview. Below is a summary of what to expect when the new AuthenticJobs.com goes live in a few weeks. This is a significant departure from our previous designs, which were much more realign than redesign. This version is both realign and redesign — an iterative evolution of a decade-old product and a complete design & code overhaul. We felt this was the perfect opportunity to overhaul UI components that had remained untouched for years. Albeit they were functional, but we didn’t feel the components were holistically in harmony with each other, especially at varying screen sizes. For example, previously you couldn’t locate nearby jobs with a single tap on larger screens—that was reserved only for smaller screens. Now you can locate nearby jobs with a single tap on any size screen. This new design is far more responsive than the last. The previous design (2011) adapted well to common screens sizes among mobile phones, tablets, and larger screens. However, functionality was limited on some screens sizes, and many more screen sizes have emerged since 2011. In fact, today “common screen sizes” might be considered ridiculously and unreasonably subjective. The new design is fully responsive, both content and function. Anyone can access the site regardless of screen size, and anyone can access nearly all functionality irrespective of their viewport dimensions. 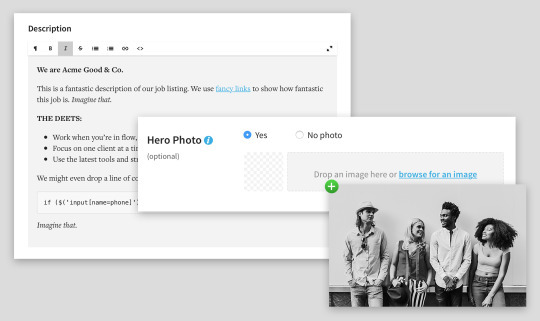 We’ve redesigned the job listing pages to make the job itself the hero, placing greater emphasis on the title and meta data. Employers can also include beautiful ‘hero’ images with their description that personify the company, its culture, or the team candidates will be a part of. By the way, we spent loads of time fontsploring the right headline type, and we couldn’t be happier with Questa by Martin Majoor & Jos Buivenga. Additionally Freight Text Pro (Joshua Darden) and Source Sans Pro (Paul D. Hunt) round out the other font selections found throughout the site. 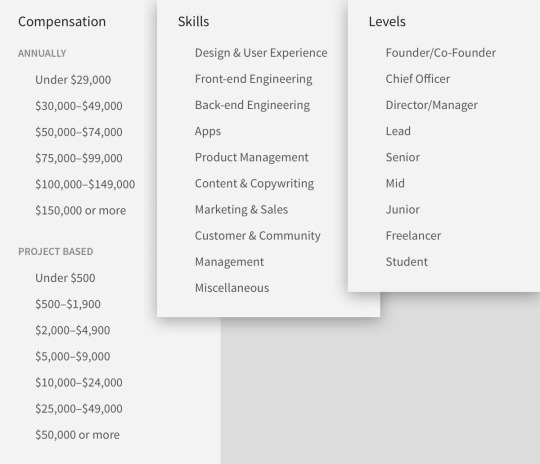 We’ve modified the Skills categories and introduced two new filtering options: Compensation and Levels. Fair warning: we don’t anticipate having any listings that match these new filters until the new design is live in a few weeks and employers begin posting jobs using these new filters. We’ve made numerous improvements to our posting process, including the use of Redactor text editor. Initial tests show it’s much more friendly to those who copy & paste job descriptions from Word documents (which is pretty common among our customers). So, please kick the tires and tell us what you think. Drop us a note with the sign-off line of your choice. “With hugs” is our favorite, but we happily accept “totally frustrated” too. Subscribe to our mailing list for updates about this redesign as well as discounts and tips for finding talent & work. If you’ve followed us over the past few years, you know the drill. We offer a discount this steep only twice a year: September campaign, and New Year’s. Visit the tweet streams of our team members to find a discount code. Get a jump start on hiring new employees and finding freelancers in 2015 with 50% off all job postings. Post as many positions as you’d like. Expires January 12. Ten. 10 years feels like forever in internet terms. Five children have joined the families of our small three-person team during our company’s existence. Imagine that. To celebrate, we’re giving away some lovely merch, encouraging companies to join us in raising funds for charity: water, and offering 60% off all job postings. We’re not sure how to top that, other than to say: Thank you. Thank you—in the most heartfelt way—to the many incredible people who have contributed to 10 amazing years. We have the most remarkable customers the world has ever known. And that’s not a hyperbole. Promise. P.S. Listen to what Cameron, Myles, Adam have to say about the past 10 years, and then listen to what our advisory board has say of the same. 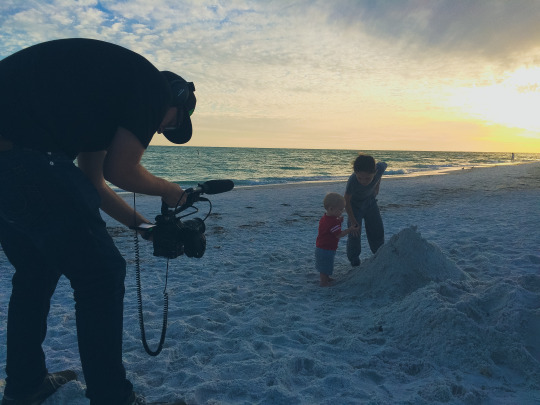 Recently the Envato film crew spent two days filming in my office and with my family. Here’s what they came up with. 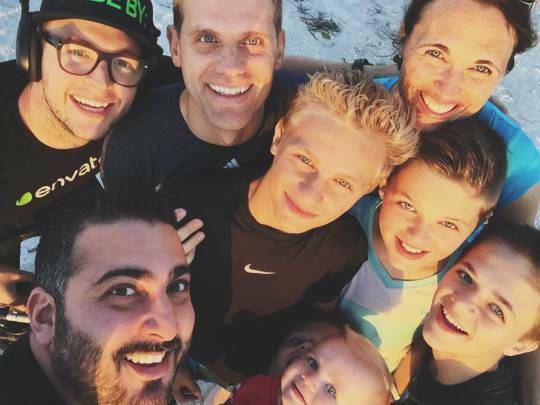 They did a terrific job of parsing through hours of video to share a side of me and of our family that the public has rarely seen. The story-behind-the-story also deserves a spotlight. Josh Janssen and Naysan Naraqi comprise the rogue film crew that Envato has sent nearly around the globe to shoot the “Made By” series and other short films. They’re incredibly nice, and they were an absolute pleasure to work with. If they represent Envato as a whole, my appreciation for the company—which was already high—has been elevated greatly. What a terrific photo Naysan captured. Lastly, if you’re not familiar with Envato, you’ve probably encountered one of their many brands if you work in the creative industry. I’ve used their Audio Jungle royalty-free audio in several videos for charity: water and personal use, and there’s some terrific stuff to be found on the site. 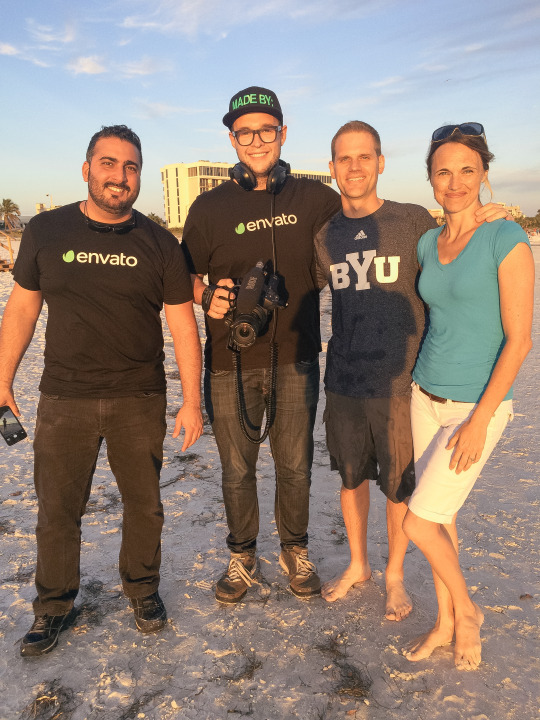 As our way of saying thanks to Josh, Naysan, and the Envato family, please check out their products. We’ve just added profile pages to Authentic Pros. If you already have an account, check out your profile at authenticpros.com/[yourusername]. You’ll also notice we’re showing your timezone with a handy-dandy reference map. We think this will prove useful for remote workers and freelancers, as well as those hoping to team up with them. Recently we released Authentic Pros into the wild. A few have asked where we’re headed with it. Brief details below. First, there’s an entire backstory to the origin and naming of Pros. Like five years’ worth (literally). But we’ll save that for another day. 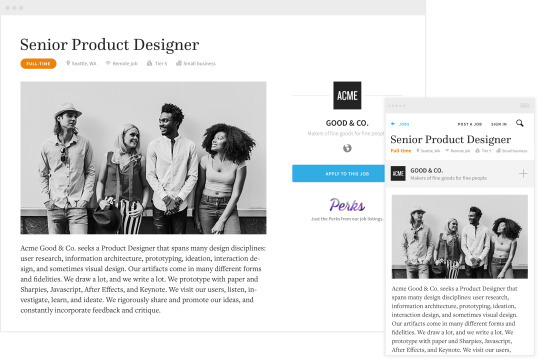 In short, Pros is a directory of hackers, designers, and creative pros. Full stop. We have wonderful plans to integrate it with Authentic Jobs in the future. But we also believe it can stand on its own as a directory of the amazing (and upcoming) talent in the creative/web industry. Authentic Pros allows you to aggregate your profile across the web into a condensed listing in our directory. In the future, we plan to provide a beefier profile using this data to paint a better picture of who you are across the web. Profile sources currently include GitHub, Stack Overflow, CodePen, Dribbble, Behance, Quora, and several others, and more to be added. Additionally, you can specify areas of expertise, size of company you’re currently employed at, and the type of work you may be interested in. Filtering options are forthcoming, but the search box—which was just added—is pretty powerful. Your account will be marked as ‘Private’ but will remain active as we develop new features. If you’ve not yet added yourself to the directory, please do so. And then hang on for the ride as we see how far we can take this thing. Add your profile to Pros. Get a jump start on hiring new employees and finding freelancers in 2015 with 50% off all listings. Visit the tweet streams of our team members to find a discount code. So, grab a discount code from our team tweets and post as many positions as you’d like. Expires January 10.